Produced by jazz legend Eddie Gomez, "Sofia's Heart" is an intimate musical diary recorded with a stellar group including Eddie Gomez and Billy Drummond. It features Pignataro's lyrical jazz conception with roots in ECM Impressionism and modern jazz. A lot of jazz is showcase, about showing something. In the quest for hip-ness and chops, the thing most often lost is expression. Marco is much more concerned with expressing something. And that is fortunate, because Jazz often suffers from a lack of expression. It is quite possible it’s not a particularly popular music. People do not need to be impressed; they need to be moved. They need to have that still small voice inside of them amplified. Good music will reveal the divine spark in the listener. It is music’s original purpose. In that sense, even the concept of art can be a distraction. A healthy society is one where everyone plays music, where there is little distinction between the performer and the audience. And as we gather to play and listen, an all-pervasive consciousness begins to be revealed and we are all made more aware of the greatness that lies within us. As I’m listening to Marco’s latest statement, "Sofia's Heart", these are the thoughts I’m having. Much of the music is dedicated to the awareness of that greatness. His commitment to beauty is demonstrated immediately on the opening track. Sleeplessness In Ocean Park starts with a beautiful stroke by the pianist, Mark Kramer and then launches into a soulful, and sullen statement of the melody. It made me wonder what Marco was thinking about that quiet night in Ocean Park. After that Marco launches into a melodic, but muscular solo. His improvisation expands the scope and the energy of the piece. Matt Marvuglio follows with a rhythmic and robust solo. Both Marco and Matt have big sounds for their instrument. One gets an immediate sense of the pianist, Mark Kramer’s heart and lyrical talents as his solo follows. The personalities of the three soloists are established early in the CD. They all clearly have voices of their own, I’m happy to report. Probably sensing that he had to come up for some light and air, Marco and the band then make a subtle transition with the tune Interplay by Bill Evans. Again their approach is delicate and emotional, but with the swing that any Bill Evans tune deserves. There is a really dancing solo delivered by Matt Marvuglio on the flute. But before Marco takes a turn on the sweet groove played by Billy and Eddie he again makes an emotional plea over an apparent rubato before launching into a cooler swing. The solo goes in and out of what almost feels like a free piece before safely landing, all within the form of Evan’s usual warm and engaging chord changes here reharmonized by Marco. Bologna d’Inverno opens with a free, yet passionate fanfare. There’s no doubt that Marco had an overriding motivation for this CD and that is not to just touch on emotion, but to live in it for a while and explore it’s different colors. After the fanfare it evolves into a straight-eighth groove that supports it’s modal harmonies. Think “Maiden Voyage” but darker, slower and mysterious. One notes the strong pillars of rhythm supplied by Eddie Gomez. The group explores a number of feels on this tune and then Billy Drummond treats us to an ultra-swinging solo before the restatement of the melody. Billy evokes, for me, some of the best colors and subtle abstraction from the “Mwandishi” period of Herbie Hancock. Finally on Grande Theodore, Pignataro says, “Enough of this” and launches an uptempo and swinging modal tune for us. Both he and Marvuglio deal with this heat quite effectively. But then we get to one of the events that one waits for on any CD with Eddie Gomez on it, a “trading of eights” between him and, in this case, drummer Billy Drummond. Eddie is one of the few bassists that you don’t really need to hear accompaniment from a piano or guitar. With Eddie, you want to leave the sound spectrum open to enjoy the full width and breadth of his sound and his brilliant solo voice. He and Billy obviously have a real affinity that is audible on this “two man solo” moment. On the next piece, Estate, by the legendary composer Bruno Martino, Marco does something I’ve never heard done on this classic piece. It almost unfolds in the form of a suite. First, he treats us to more of Eddie Gomez, again, solo, and wide open to enjoy his big sound and brilliant solo voice. The next “movement” is a passionate rubato featuring him and Marvuglio. (Rubato is obviously for one purpose for Pignataro, passion.) He’s beginning to imply the melody, but the chords have been altered in some way. That alone takes some courage as Estate is known for it’s beautiful chords. But Pignataro is resisting the pressure to let this tune intimidate him. Estate exists in this context only as a tool for his self-expression. The next “movement” launches into a D minor vamp groove. Here all three of the rhythm section lay down a really nice feel, and Matt Marvuglio seems to be really enjoying blowing over it. The solo is taken over by Marco, then goes from the D minor to chord changes, again distinguishing his section from the previous one. These still aren’t the chords to Estate. It becomes clear that the song is really serving as a premise for an extended piece Marco is composing. Finally Mark Kramer takes it from there and plays a beautiful solo, either on the same changes as Marco, or slightly altered changes, I’m not sure. That delivers us back into the rubato restatement of the melody. This may be the most unique track on the CD. “Sofia was born 4 years ago with a severe heart defect, just as you mentioned, a hole in her heart. However, it was greatly complicated by an additional coarctation of the aorta. This issue obligated the doctors to intervene surgically on her heart after only 2 weeks of age, with a great risk of losing her. However, the operation was successful enough to have her finally at home. Our happiness of this miracle newborn baby completely overshadowed any stupid preconceived notions we may have had about having a Down Syndrome kid. However after 2 years of great happiness with Sofia growing and filling our life with incredible love, the doctors let us know that she needed another open heart intervention, just as risky as the first one. This operation was extremely successful and Sofia is now back home and doing great, thanks to God's Grace. The song Sofia's Heart, describes my perception of the time preceding the latter operation, the agony of the wait, the agony of the post operation in seeing her in a hospital bed with tubes sticking out every which way from her tiny chest and mouth and our overall feeling of uncertainty about the final outcome. There was this moment preceding the operation when we had her in our arms, and the nurse came to get her from us to bring her to the surgery room; in my heart it felt like an empty space in the universe that not enough tears could ever fill; me and my wife shockingly holding ourselves as we were seeing our most precious gift get taken from our arms to a dramatic operation without knowing if we would ever see her again. That deafening quiet moment is still in me and it was the inspiration of the Sofia's Heart theme. I know very well, that you, out of all people, can feel and understand this deeply. If that be the case, then we are extremely fortunate to be listening to this album, because we do get the privilege of hearing the song, and perhaps crying along with it for as with any great art, the piece doesn’t just express the artist’s emotion, but is a mirror from which we can experience our own. Sofia’s Heart and the entire album, gives us that opportunity. Every heart needs a release occasionally, a chance to be cleansed by the tears one refrains from releasing most of the time. And when those tears flow, we are grateful that we’ve dropped our defenses for a moment and allowed ourselves to feel those feelings. If we don’t let that happen from time to time our hearts literally become sick. Marco Pignataro does us a great service here. He gives us a vehicle to drop our defenses and feel all the joy and pain we normally suppress. One could not ask for more. When I am asked to explain what (and how) it is I do, I often turn to an educational technique that helps clarify an often-misunderstood process. That technical tool is “metaphorical comparisons”. For instance, many might understand that when I’m hired to perform on record, my obligation is simply to play at the very highest level possible. I can easily clarify this endeavor by comparing my “job” as a musician to a team player on a basketball team (sports metaphor), or an actor in an ensemble theater or film piece (thespian metaphor). These metaphors are usually easily accessible for most (lay people) to grasp. Pre production, production and postproduction is another matter. It all begins with an idea, a melody, a piece of music (the story and the script). Remember the metaphor. Marco Pignataro’s CD came to fruition from an idea, concept and vision that gestated in his soul for a long time. But, as artists, musicians, filmmakers and etc., we also need the help of those that objectively bridge the gap between the creative process and the reality of making this dream come true. This is what producers do. An executive producer is like the record company or the film studio, or simply a patron that bankrolls your dream; sometimes the artist must do it all by himself, this is exactly what Marco Pignataro did. Next, Marco came to me for advice. I immediately said I would like to be part of the project as musician (bass player), but I also wanted to help produce his dream. And so we discussed the musicians (the cast - the team) and put together a first rate ensemble. We decided the where (Mark Kramer’s state of the art studio in Philadelphia) and we found a window in which everybody could comfortably participate in Marco’s dream. ‘Sofia's Heart’ is Marco Pignataro’s dream come true. Marco, myself, Mark, Matt and Billy, who constitute the stellar cast of this record, all made it happen together, while having fun doing it. The result was so good that record companies started calling Marco (theaters all over wanted Marco’s movie). And so I’m proud to have been a part of Marco Pignataro’s dream, not only as an actor in his movie but also helping to get his movie into your neighborhood theater, and perhaps part of your DVD collection. "There are some dates that are recorded, and then are quickly forgotten. ‘Sofia's Heart’ is not one of those sessions. All had extraordinary concentration, focus, and team spirit during the recording process. It is It was also clear, that when the group congregated informally to eat and talk, it was a group of friends. unusual for a group to play so fluently from the outset . As I recall the CD opens with " Sleepless in Ocean Park", which is the first tune of the session. When a group plays together so well so immediately, there is probably something very spiritual in the atmosphere, guiding the recording process . It is a great gift. After years of discipline, I now understand that when that happens I just need to submit to that "force." That force is my teacher. My receptivity is much more than "comfort zone:" No, I am being in the presence of grace in my "comfort zone." It is close to a miracle, if not a miracle. Eddie Gómez and I have played and recorded together in trios and duos for almost two decades; we celebrate the gift of "grace" when we perform or record. However, to experience the same thing happen so readily in a relatively new quintet with Marco, Billy, Matt,. Eddie and myself, this was frankly "mind-blowing." I'd played twice before our recording sessions with Marco and Eddie, once in Puerto Rico, and a second time in New York. I'd played with Billy once before in New York with Eddie as a trio. Marco played with Matt, and Eddie in various occasions before. So, there is an overlap of experience playing together. It is fortunate that Eddie and myself played recently with Billy before the session. Because we are the "rhythm section." It was also clear, that when the group congregated informally to eat and talk, it was a group of friends. But more than that, I'd like to think that the material which Marco selected, most of which he wrote, in large part determined the mood which was captured. Marco told us what most of his pieces meant to him. I hope he recounts the meaning of his compositions in his liner notes. As I listened to the stories of "Homesick", and "Sofia's Heart" (for example) and heard this music in my mind's ear, I was touched quite emotionally. These performances thus have a haunting emotional depth. Any technical virtuosity, which is present, is natural and is in the service of telling the story of the music. The virtuosity is not self-serving. For myself, Marco's music kept calling me towards providing clarity. Overall, I was so pleased to be involved with this project as the pianist. It was, even after so many years of playing, an opportunity for musical discovery. This CD confirms for me once again that "Less is more" at times. It also demonstrates that "More is more" at the right time. The musicians who understand "when" to be playing "less versus more" are already operating on another level, more or less!!! The CD is a stunning achievement for Marco, and one, which I am sure all the participants also "celebrate strongly and deeply." I hope fans will spend time listening to this CD with clear minds, open hearts, and with "awake bodies." The rewards for them will be as meaningful, as they are wonderful. " The first time Marco and I played together was at the Seminario Encuentro Jazz Fest in Xalapa, Mexico. We played Marco’s tune, Sleepless in Ocean Park. I was really surprised how we managed to get a nice blend between the flute and the tenor right from the start. Usually, these two instruments are on the opposite ends of the color spectrum. But we were able to get this dark woody blend that is quite unique to this instrumentation. The harmony parts in Bologna d’Inverno were inspired by the rich sonorous blend of the flute and the tenor. When I think about playing Marco’s music and playing in the band, it has been a very relaxing, fulfilling experience. The music has a gentleness and fearlessness that seems to be the source of its strength. The swing factor is huge playing with Eddie and Billy. This groove combined with the introspective melodies and Mark’s harmonic interpretations of Marco’s tunes, create a blend of Jazz with roots in Impressionism and Expressionism. This becomes evident when you listen to the ensemble playing and the interplay among the different soloists. The CD that you are listening to was very enjoyable to make for many reasons: The music that Marco Pignataro wrote and arranged is fresh, creative, and challenging as well as fun to play. All the guys had an instant rapport. And Mark's state of the art studio and generous hospitality made the whole process a piece of cake. I have played with Eddie, an icon in jazz, in different musical situations over the past few years, including trio with the wonderful Mark Kramer, which was extremely rewarding. I hadn't played with Marco and Matt before but their excellent musicianship was evident right from the first note and everyone's level of musicianship meant that we were able to record without a formal rehearsal. We went over each song and recorded it right there and then in the studio, in the true spirit of improvisational music. Recording and performing like this keeps you on the edge of your seat as a player, making all of your musical instincts and training come together to create a wonderful musical portrait of a moment in time. Hopefully this comes across to the listener as well. I'd like to thank Marco for inviting me to be a part of this musical snapshot and I look forward to making music with these world class musicians in the future. Enjoy. Every so often, if you're lucky, you find an artistic work that touches and transforms you in ways you could never have imagined. 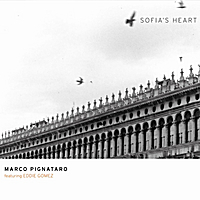 Marco Pignataro's "Sofia's Heart," is just such a work; truly ethereal: you don't just listen to it, you feel it. Beginning with what has become my favorite, "Sleeplessness in Ocean Park," each track on the CD is beautifully performed with a compassion and enthusiasm that is wonderfully evocative, touching and soulful; his original compositions revealing the uniqueness of a wonderfully accomplished craftsman. The title track, "Sofia's Heart," is a moving homage to his daughter's struggles through, and recovery from, heart surgery (read Kenny Werner's liner notes for the full story). Sincere without being melodramatic, there's a lovely lightness to the spirit of the piece that captures the essence of his pain and subsequent gratitude. It is one of the most incredible musical tributes from a father to a child ever recorded. "Sofia's Heart" is like nothing I had ever experienced, and for that reason alone, it has indeed become a favorite. With such a fantastic debut, I cannot wait to hear where Marco goes from here; no doubt others will find themselves feeling the same.